If you are going to be in Ellsworth, Maine this weekend, stop by at the Ramada Inn (old Holiday Inn) and check out the talented company I’ll be keeping at the Beads Baubles and Fleece Downeast show! This is going to be a great opportunity to see some friends I haven’t seen in a while, and to see what they’ve been creating lately. 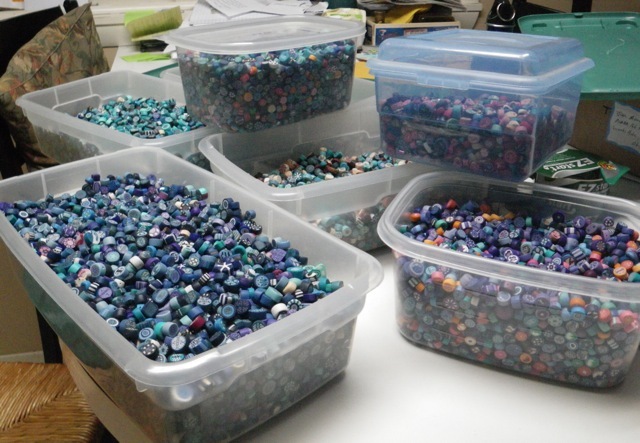 It is also a chance to de-stash my own studio a bit as I offer some beads I haven’t used in a while. 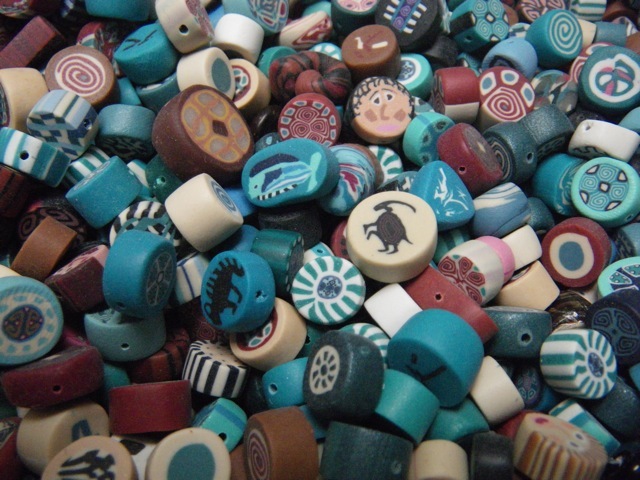 Once upon a time, before PMC was invented, I made a lot of my own polymer clay beads. I created colorful canes to slice fire and drill so I would have plenty of 8 to 10mm beads to use in multi-strand, multi-colored necklaces. I like all kinds of beads, but I love making my own beads to use in combination with others. 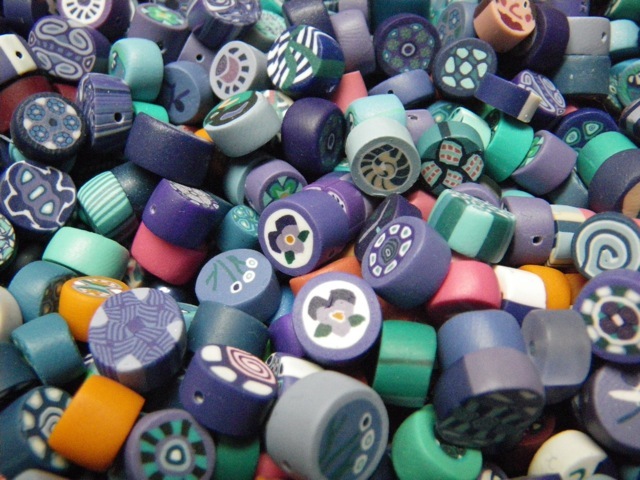 For many years these Fimo beads fit the bill. I could make canes and slice them into beads all day long. I made many many necklaces with them. Then, in 1998, Fred Woell introduced me to a product from Mitsubishi Materials known as Precious Metal Clay. I learned to make beads from silver that started out as a moldable metal clay. Once the “clay” was fired, and the binder burned away, I had beads of pure silver. 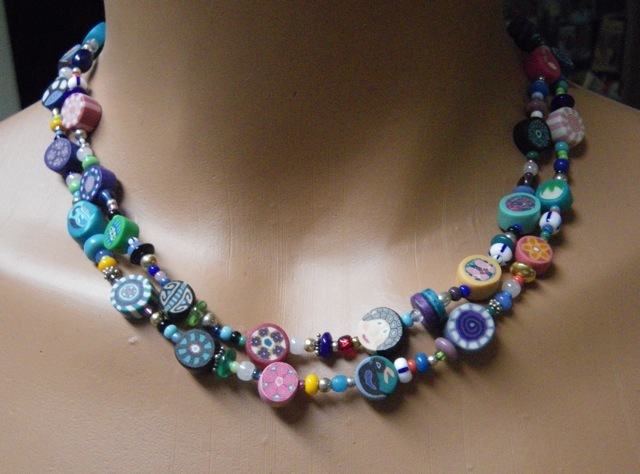 Eventually I said goodbye to the polymer clay, and stored my many handmade beads high on a shelf in my studio. These boxes represent hours and hours of work. I have no idea how to price them, but I will come up with a plan before Friday. Bruce suggested selling them by weight, using a scoop. It sounds like a pretty good idea. I will also have some jewelry for sale at my booth, though I’m running out of time to finish more necklaces. I’ve never sold beads or components before, but it’s an idea I’ve had in the back of my mind for a few months since I like to buy beads and components from other artists on Etsy. 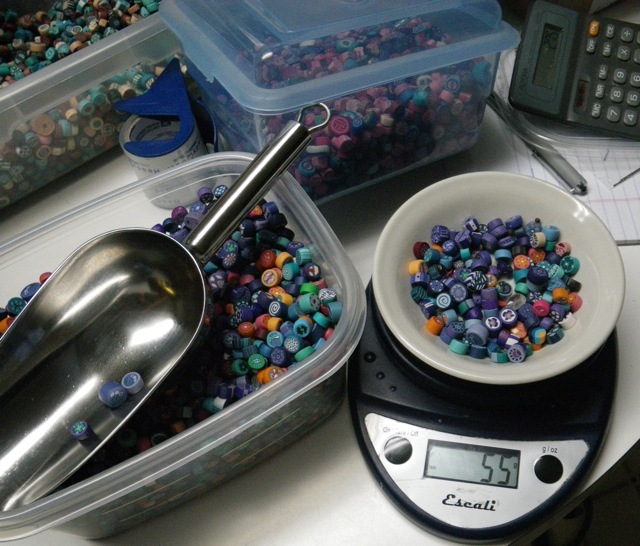 I enjoy making beads so much, I wonder what it would feel like to stop at that point and sell them, rather than work them into necklaces or earrings. What if I have the prices too high and I can’t sell them? What if I have the prices too low and I piss off other sellers at the show? What if I sell beads I really like and then wish I had kept them? What if I sell everything on the first day? What if I sell nothing in two days? What if my display looks cheesy, tacky, unprofessional? What do you know? My insecurities about selling beads at a show are the same insecurities I have about selling jewelry at a show. Only this time I’ll have both beads and jewelry for sale. It’s time for me to remember that I’m not the only one who feels this way before a show. Maybe I could just lighten up and decide to have a good time no matter what. But first…I have a few holes to drill….